TCU will enter the 2016 campaign without one of its key veterans in senior outfielder Nolan Brown, who will miss four-to-six weeks after undergoing surgery for a hamate bone injury. The Frogs are hopeful that Brown can be back for the second week with a trip to Houston to face two ranked teams in three days, including Louisiana-Lafayette, Houston and Rice, which was just on the cusp of the D1Baseball Top 25. Brown almost surely will miss the season-opening home series against usually scrappy Loyola Marymount, and it will be interesting to see how the Frogs navigate things defensively over the next few weeks. Brown moved from right field to center field during fall workouts with the departure of spark plug outfielder and leadoff hitter Cody Jones. He was expected to take over for Jones both in the field and at the plate after finishing last season with a .301 batting average, 11 doubles and 30 RBIs, while his greatest asset was in the speed department with 19 steals. So, what does TCU do without Brown to prepare for the LMU series? 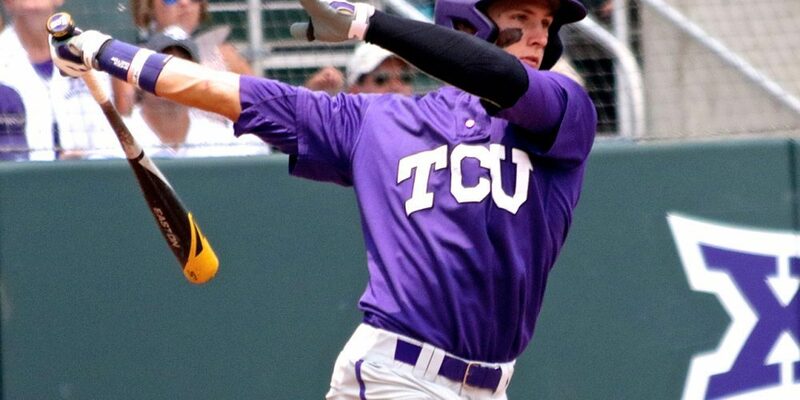 For now, it looks like the Frogs will shift senior right fielder Dane Steinhagen over to center, while sophomore outfielder Austen Wade, who had a strong showing this past summer, is another option. This also opens the door for talented freshman Ryan Johnson to get more playing time from the start. Johnson, a 6-foot-3, 205-pounder, was one of the more toolsy prospects out of high school last season with an outstanding frame. And, though all the tools are there, scouts last spring wanted to see more consistency from an offensive standpoint. Johnson might be a little raw, but his tools could really play up if he can make a quick transition. The No. 19 Horned Frogs will have some great stories to watch this spring. In addition to the infusion of a prospect like Johnson, they also have one of the better two-way first-year talents in the country in Luken Baker, who will start in the weekend rotation, and who’s expected to provide some instant power production. As for Brown, he will heal in due time, but Schlossnagle and the Frogs certainly would’ve liked to have him opening weekend.